Marine veteran Peter Ash is off to Memphis to help his girlfriend June’s photojournalist friend Wanda who is receiving death threats. She’s going to need a lot of help – a truck has just crashed into her house. While he’s helping fix the place up (and trying to keep his claustrophobia in control), Peter’s own truck is stolen by a teenager on the run from a heist, only what Eli is running towards might be even more dangerous than the law that he’s running from. I love how each player has their own sense of justice. There’s no way they can all get what they want, and it all plays out with the suspense turned up to maximum decibels, in this latest entry from the author of The Drifter. This lightning-paced series continues as Peter Ash gets tangled up in the City of Blues with two new friends and two new sets of problems. 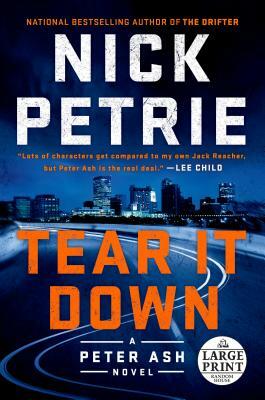 This far into the series, you know you’re in good hands with Nick Petrie, and this installment is no different, with a high-wire-act plot he struts through with flair, twisting the strings of two different stories up into one big knot that rolls all around Memphis. Particular to Tear It Down is the strong sense of place and the people who come from it that Petrie translates onto the page. Peter isn’t the only one struggling with the scars of his past here - all the characters in this book are, in their own ways, dealing with the good and evil they’ve inherited, from their family, from their circumstances, and from the land, and Petrie captures a particularly Southern sense of history and the way the past keeps a tight grip on our present lives. His writing about the blues sings, too, sweet and gritty like a worn out, gut bucket beater guitar played on the cracked sidewalk of a crossroad where even the devil forgot to stop by. NICK PETRIE is the author of three novels in the Peter Ash series: The Drifter, Burning Bright, and the forthcoming Light It Up. His debut The Drifter won both the ITW Thriller award and the Barry Award for Best First Novel, and was a finalist for the Edgar and the Hammett awards. He received his MFA in fiction from the University of Washington, won a Hopwood Award for short fiction while an undergraduate at the University of Michigan, and his story "At the Laundromat" won the 2006 Short Story Contest in the The Seattle Review, a national literary journal. A husband and father, he lives in Milwaukee.